I had known the original owner of the Rickman Enfield 750 for ages. He was one of those characters who you think will stick with bikes for the whole of their lives and then one day you see them in a suit driving a new Ford Orion. He had just married a girl half his age who abhorred motorcycles, so the the Rickman was sitting in his garage awaiting a new owner. Sensing the possibility of a bargain, I admitted that I might just, possibly be interested. Rickman were well known in the seventies for production of rolling chassis that improved the handling of such things as CB750 and Z1 fours. 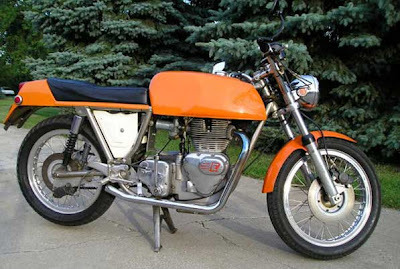 For a while, they also used a similar chassis to house Royal Enfield’s Mark 2 Interceptor motor, being able to pick up a large quantity of engines when Enfield were in the final throes of disappearing from the motorcycle world. Enfield had always been slightly in advance of the other British manufacturers but never hit the big time sales wise. The 736cc motor followed common British practice with pistons moving up and down together and pushrods actuating the valves. It differed significantly in having the oil contained in a sump cast integral with the crankcase, although it was not quite the wet sump design so popular with the Japanese as oil was still pumped around the engine in the conventional British manner. Its most significant difference was a hefty forged crankshaft supported by a large roller bearing on one side and an equally impressive ball bearing on the other. Enfield went to great pains to diminish vibration by dynamically balancing the crankshaft, although ultimately it could never offer the overall smoothness of an engine with pistons that move up and down alternatively, let alone rival Japs fitted with balance shafts. At first glance the engine looks like it is a unit type but in fact the gearbox is a separate item that is bolted on to the back of the crankcases. Primary drive is by duplex chain, albeit a fairly skimpy 3/8" one, to a fairly conventional clutch and four speed gearbox that dates back to the forties in its inspiration, if that is the correct word. It later turned out to be heavy and slow but very precise in action. The relatively tall engine (it has a bore and stroke of 71x93mm) sits well in the duplex Rickman Metisse frame. The 1974 example with 28000 miles on the clock sitting in my friend’s garage still looked good, the nickle plated frame but slightly tarnished and the big red GRP tank only slightly scruffed. The heavily lacerated seat was another but minor matter. The bike had some quaint Rickman features such as high bars but mounted individually on the forks as per clip-ons and the rider’s footpegs welded on to the exhaust down pipes, something so strange that I have not seen it before or since.....I had a go at trying to start her. After three lunges I gave up. Running on 9:1 compression pistons and the racier of the cams that Enfield made available for their twins, not to mention a pair of bellmouth 30mm Amals, made the Interceptor a bit of an animal to get going. My friend had her running first kick, much to my dismay and disgust as he’s about half my weight. There was no choke mechanism fitted to this particular bike, much blipping of the throttle was necessary to keep the cold engine going. First impressions once aboard the Rickman were that it was a bit high off the ground - you felt perched on it rather than part of the machine - and that the vibes were worse than a Bonnie, mainly caused by the way the petrol tank rattled away merrily. Engine noise was something else, it sounded just like a dog CX500 with the camchain tensioner gone missing. First gear was on the tall side and the extremely heavy clutch had to be slipped whilst the throttle was blipped. Although there was a rev counter fitted it didn’t work; after the first few hundred yards I realised that the speedo was in the same state (I was assured that there were some spare cables around somewhere). It didn’t even feel as good as a Bonnie chassis wise, there was an edgy and twitchy feel to the machine as I gently growled around suburbia.....on returning I found out why, both tyres were down to the bare carcass. I wasn’t that impressed to be truthful, but when he said I could have it for 400 notes if I got the money to him that day I couldn’t resist the deal. He threw in a large box of spares, too. I took him on the back to my bank where the exchange of cash for documents took place. After sorting through the box I found replacement speedo and tacho cables and then immediately headed for the nearest bit of dual carriageway to see what she would do. 86mph! The engine was running decidedly off tune, nowhere in line with its claimed 56hp at 6750rpm. The bike was geared to do a theoretical 125mph at 7500rpm in top (fourth) gear but it could pull no more than 5000 revs. The rattle appeared to be coming from the camshaft drive area. The Enfield has two cams mounted just above the crankshaft, both cams driven by the same bit of chain running off the end of the crankshaft. Enfield didn’t use a tensioner as such, but a fourth gear was mounted on a slotted plate and took up any slack in the drive train....in my case the chain was so shagged that the gear was adjusted to its fullest extent. I removed the chain and took out three links and then riveted the chain back together, it being of the endless type. It was a lot of hassle to get everything lined up as per the manual but I managed it eventually. I knew I was on the right track straight away. The motor burst into life first kick with a surprising eagerness and the vibration level was much more tolerable at tickover. Out on the dual carriageway, a much more impressive 110mph was quickly attained before I chickened out as the bars had started jumping about. I just wanted to make sure there was some worthwhile go in the motor to make spending out on the chassis a decent investment. There was a hell of a lot that needed doing. The bike had single discs at each end, neither of which worked very well. The rear brake was especially disturbing as nothing seemed to happen for ages and then the back wheel would lock up. Not that surprising when you consider that the brake lever actuates a master cylinder placed half a yard away on the swinging arm which then compresses fluid through a couple of yards of aged pipe to the disc on the other side of the bike. The front had a bit more feel but was less powerful than many a TLS drum I’ve used. An expensive pile of new bits from the only dealer I could find who stocks parts for these ancient discs helped out but I am still less than happy in the wet and have been thankful many times for the large dollop of engine braking that’s available. Give me a decent set of drums any day! Once I sorted the discs, polished all the engine and chassis alloy, lockwired several loose nuts and bolts in position, replaced the tyres with a set of Avon Venoms and had the seat recovered, I had a basic machine that was in sound shape. Much to my surprise in the past three years and 21000 miles nothing major has gone wrong.There are several problems with the bike, though. The most obvious is the oil seepage, most of it out of the primary chaincase, one of those quaint bits of design which is held on by just one screw. Brand new from the factory it might have worked until the first time it was removed, but after 17 years there’s no way I can stem the tide. It also leaks, though less copiously, from the gearbox casting and timing gear cover, as well as a very slight seepage from the head gasket (actually a steel ring rather than the usual copper gasket). The more serious problem is vibration. Maybe something in the engine is a little too worn out, but it vibrates badly enough to make things drop off. The most sensational was the complete headlamp which was held in position by what remained of the wiring loom (I’d had to do some radical mods to get the 12V system working in the first place). I even had one carb fall off, leaving the hot engine awash with petrol. Any bolt or nut that has fallen off once is put on the next time with a spring washer, Araldite and finally wired in position - this seems to work eventually; in the last 5000 miles nothing has come adrift. The motor runs best between 3000 and 5500 revs where vibration levels are on a par with a 650 Bonnie. Higher revs results in massive vibes through the feet, hands, knees and backside. There is a bit of an art in matching engine and frame characteristics, evidently not one perfected by Rickman. Or it may just be that my engine isn’t as well set up as it should be. I am little disappointed by the chassis, it’s no better in stability than a well set up Bonnie and less agile. There again I haven’t got around to refurbishing the suspension yet, the front forks managing to be harsh and spongy at the same time, the single sided disc twisting the legs when used in anger, the GRP front guard offering no rigidity (and the universal clips holding the guard on are prone to loosening off).I have managed an indicated 120mph without being thrown around too much, so the geometry is probably about right. It will breeze along at 80 to 85mph in a vaguely contented manner without any apparent problems and do 50 to 55mpg most of the time, so it’s quite practical. The rear tyre lasted 13000 miles, the front hasn’t worn out yet, which compensates for drive chains that don’t last more than 6000 miles. Speedo and rev counter cables don’t last for more than 5000 miles. Maintenance is a bit of a pain as the valves and points need attention every 750 miles, which is as good a moment as any to change the engine oil. The duplex primary chain has been remarkably stable in its tension needing no adjustment, although they are hard to get hold of. The carbs stay in balance for anywhere between 400 and 900 miles, mostly down to the vibes - it’s easy enough to know when they need doing because both clocks blur vigorously at tickover when they are slightly out. It’s nicest moments are when you are doing 55mph in top gear and decide to open up the throttle. Typical of long stroke engines, there’s this gut wrenching dollop of torque that makes your hair stand on end and thrills you so much until the engine starts entering the heavy vibration zone at around 95mph. On fast B roads and slower A roads you hardly need to touch the brakes, you can just lose speed by rolling off the throttle, delighting in the sound of a big twin on the overrun. Its worse moments are after half an hour in town when the engine starts to overheat. Clutch drag makes it impossible to change gears or get it into neutral and it’s very easy to stall the motor. The engine sounds rough, the chassis feels nervous and waves of heat and vibes shudder through the machine. Tickover goes to pot and you’ve got to rev it to five grand with the brakes half on and an aggressively slipped clutch threatening to make an engine rebuild imminent. The best thing to do is to turn the motor off and go buy a pint for an hour or so. Of course, actually getting served in a pub is no easy task. Forget any ideas of sartorial elegance you might have harboured. You get absolutely filthy riding the Rickman, the mudguards are so minimal that you are drenched the moment it rains and the engine pumps out oil over your feet and legs. Of late, the petrol has started seeping out of the GRP tank as well, so after five minutes you stink of four star. I did meet one owner who claimed my bike was a mongrel because he had an alloy tank, although I told him his must be the mongrel and mine original.....I’m not a Rickman Enfield fanatic and have no idea of the truth of the matter, I just want a petrol tank that doesn’t leak. It’s cost me seven hundred notes in total, too many hours of work and a lot of sweat to get into its current condition. I do like the beast but it’s not one of those great love affairs. I’ve ridden too many British bikes to be that easily seduced and if anyone offered me two grand for it (the price I see them advertised at) they could have it tomorrow. No problem.